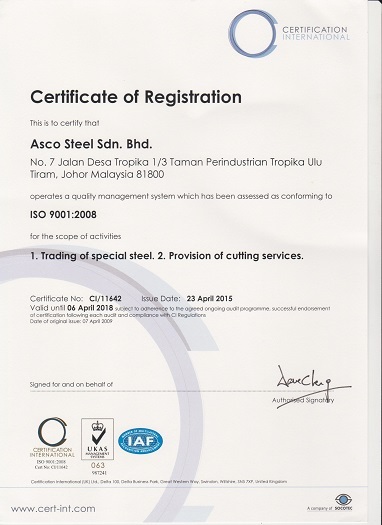 Asco Steel Sdn Bhd was incorporated in 2007 had specialized in providing all kind of High Quality Steel with One-Stop Solution Service to the client and we looking forward to form a long term muture benefits business partner with our customers. Asco Sistent Steel Sdn Bhd was incorporated in 2011 at Selangor to enhance services to middle part of Malaysia. 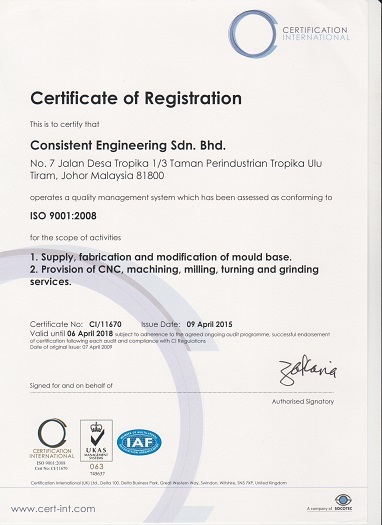 Asco Steel & Mould Sdn Bhd was incorporated in 2015 to serve Mould & Die Customers in Penang. Asco Engineering (Thailand) Co. Ltd was incorporated in 2013 at Bangkok to serve Mould & Die customer in Thailand. In the year 2008, the company honourably achieved the prestigious ISO 9001:2008 Quality Management System certified by Certification International. To develop enthusiastically satisfied customers all of the time. To be recognized by our customers as the leader in applications engineering. We highly motivated and strive to advance our technical knowledge in the areas of material and fabrication technology.